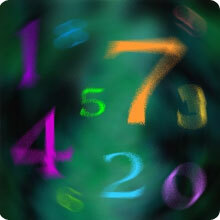 People with lucky Number 8 are focused on learning the satisfactions to be found in the material world. The lucky Number 8 produces many powerful, confident and materially successful people. They are apt to be very independent, forceful and competitive. Their routine is involved in practical, down-to-earth affairs, and there is relatively little time for dreams and visions. They will want to use their ambitions, their organizational ability, and their efficient approach to carve a satisfying niche for themself. Most of their concerns involve money and learning of the power that comes with its proper manipulation. This lucky Number is perhaps the one that is the most concerned with and desirous of status, as an accompaniment to material success. If they are a positive 8, they are endowed with tremendous potential for conceiving far-reaching schemes and ideas, and also possessing the tenacity and independence to follow them through to completion. In short, they are well-equipped for competition in the business world or in other competitive fields of endeavour. They know how to manage themself and their environment. They are practical and steady in their pursuit of major objectives, and they have the courage of their convictions when it comes to taking the necessary chances to get ahead. The negative 8 can be dictatorial and often suppresses the enthusiasm and efforts of fellow member of the environment. Often, the strength of their own personality excludes close feelings for other people with whom they come in contact. Material gains and rewards often become issues of utmost importance, even to the neglect of family, home and peace of mind. Dedication to success can become an obsession. Emotional feelings are often suppressed by the negative 8, resulting in isolation and loneliness. All lucky Number 8 people must avoid discounting the opinions of others.